This quick review was provided by Taylor, who is allergic to peanuts, tree nuts, coconut, dairy, and soy. Although I am usually very apprehensive with pre-fixe menus given my allergies, I decided to give Hoop-De-Doo Musical Revue a try since it got great reviews. When my waiter got to the table, I immediately informed him of my food allergies and he called over Chef TJ. 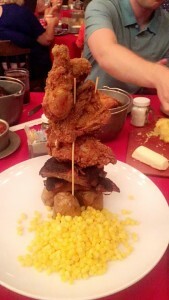 Chef TJ made me a modified version of the what was served to everyone else (fried chicken, ribs (no sauce), corn, and baked potato). For dessert, chef TJ made me one of his special concoctions. I was literally stuffed from dinner so I didn’t eat much of the dessert. Overall, this was an amazing experience. 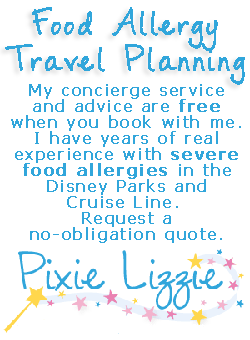 Disney is truly a magic place, especially for those with food allergies! 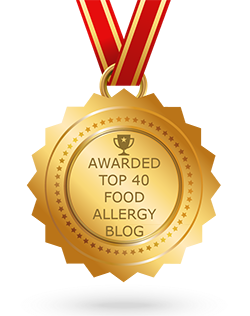 If you would like to review Hoop-De-Doo Musical Revue or any Disney restaurant, submit a food allergy dining Quick Review.